Disillusioned and yearning for freedom, Emily Wierenga left home at age eighteen with no intention of ever returning. Broken down by organized religion, a childhood battle with anorexia, and her parents' rigidity, she set out to find God somewhere else--anywhere else. Her travels took her across Canada, Central America, the United States, the Middle East, Asia, and Australia. She had no idea that her faith was waiting for her the whole time--in the place she least expected it. 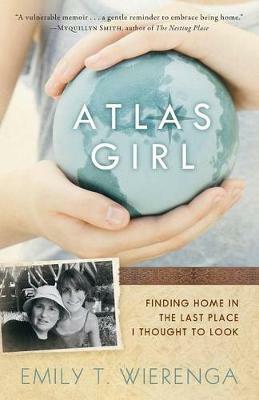 Poignant and passionate, Atlas Girl is a very personal story of a universal yearning for home and the assurance that we are known, forgiven, and beloved. Readers will find in this memoir a true description of living faith as a two-way pursuit in a world fraught with distraction. Anyone who wrestles with the brokenness we find in the world will love this emotional journey into the arms of the God who heals all wounds.